Sefton businesses have it all wrapped up! 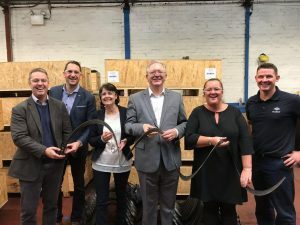 Sefton Council’s Labour Cabinet Member for Regeneration and Skills, Cllr Marion Atkinson and Bootle MP, Peter Dowd, recently visited two south Sefton businesses to hear of their development plans. The tours were set up by InvestSefton – Sefton Council’s enterprise, business support and inward investment service who have helped both businesses through their ERDF Business Growth programme. First up was a site visit to Hardy UK – a leading Bootle-based manufacturer and supplier of precision blades to the global leather industry. Currently trading from Fernhill Road, Bootle, they employ 17 staff with the majority of them living in the borough. With a long term plan to stay locally and grow the business and workforce, InvestSefton is assisting the business in their future growth plans and previous support has included Regional Growth Funding, assistance in becoming a member of Sefton Export Group and introductions to LJMU and Manufacturing Technology Centre. The group then visited Gift Wrap Direct Ltd – an owner-managed business based in Netherton. The business specialises in commercial B2B print and design services, including large format prints, banners and pop ups, and corporate gifts. They also have two outlets in the Liverpool City Region for print services for businesses and retail customers. InvestSefton is assisting with preparatory work and market research for the concept and content for an e-commerce site, and an application for funding towards the cost. Cllr Marion Atkinson, Sefton Council’s Labour Cabinet Member for Regeneration and Skills, said: “Yet again it was great to hear how local businesses are thriving in the heart of Sefton and their stories capture so many interesting opportunities. “For Hardy UK, they have become a long established company in Sefton and has remained at the forefront of technology in blade design and manufacture for the global leather industry; we have been delighted to support them with their growth plans”. “Gift Wrap Direct UK are another success story and have benefited from the excellent support offered by InvestSefton as they go from strength to strength. Ian Coughlin, Managing Director of Gift Wrap, said: “We have had great support over the years from InvestSefton with Julie Swarbrick being pivotal in our growth and expansion plans. Don't trick or mistreat during Halloween and Bonfire night! Senior coroner retires from post after 20 years-service.